HardyPet canine supplements have been carefully formulated, tested and evaluated for their safety and effectiveness. Each formula contains the same high quality pharmaceutical grade ingredients which have been specifically selected for a particular benefit to canine health. While each of the HardyPet formulas contain the same individual ingredients, there are differences in the amount of each ingredient in each formula. HardyPet Complete provides a proven balance for overall canine health. HardyPet Skin&Coat/Joint/Immune formulas contain different quantities of each ingredient from the original HardyPet Complete formula. Our "condition specific" formulas provide more of the ingredients that provide the most benefit for that particular condition. For example, HardyPet Skin/Coat provides a higher ratio of ingredients like Cat's Claw, Evening Primrose Oil and certain Amino Acids that are known to address skin and coat issues. This allows concerned dog owners to tailor the nutritional approach for their dog according to their needs without having to purchase a separate product for joint health, skin conditions, and a multivitamin. All ingredients we use are sourced domestically in the United States and undergo no less than a dozen quality checks from when they were harvested to when you open your dog's bottle. Our unrelenting commitment to quality allows us to guarantee that every wafer in every bottle provides the nutrition your dog needs, safely and effectively. By far, the most complete daily canine vitamin available, with or without a prescription. Originally designed to rapidly rehabilitate rescue dogs in shelters in order to increase the possibility of adoption, HardyPet Complete is made with over 40 pharmaceutical grade ingredients. This combination of holistic natural compounds, amino acids and broad spectrum vitamins provide the essential nutrients all dogs need to achieve optimum health. AN AUTOSHIP VERSION OF THIS PRODUCT IS ALSO AVAILABLE FROM OUR PRODUCT LIST. HardyPet Skin/Coat is specifically formulated version of our original HardyPet Complete which contains the same amazing 42 ingredients as the Complete, and slightly more of the ingredients which specifically address Skin and Coat issues. AN AUTOSHIP VERSION OF THIS PRODUCT IS ALSO AVAILABLE FROM OUR PRODUCT LIST. HardyPet Skin/Coat is specifically formulated version of our original HardyPet Complete which contains the same amazing 42 ingredients as the Complete, and slightly more of the ingredients which specifically address Skin and Coat issues. AUTOSHIP PROGRAM PROVIDES REDUCED COST AND FREE SHIPPING. See Program Rules Below. 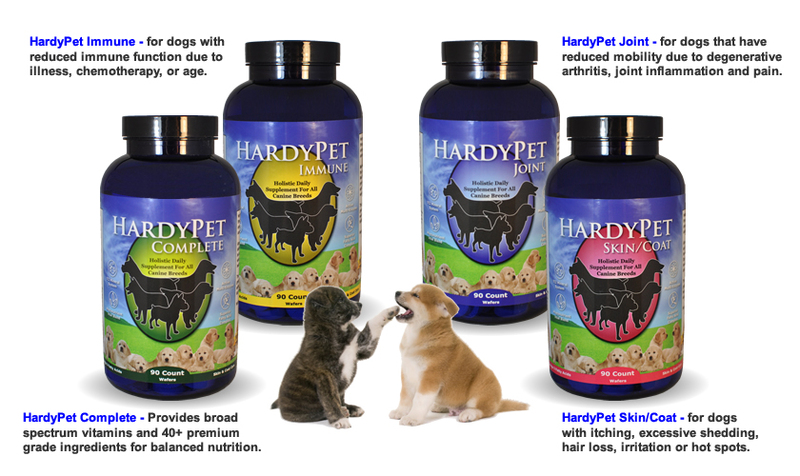 HardyPet Joint is specifically formulated version of our original HardyPet Complete which contains the same amazing 42 ingredients as the Complete, and slightly more of the ingredients which specifically address Joint and mobility issues. AN AUTOSHIP VERSION OF THIS PRODUCT IS ALSO AVAILABLE FROM OUR PRODUCT LIST. HardyPet Immune is specifically formulated version of our original HardyPet Complete which contains the same amazing 42 ingredients as the Complete, and slightly more of the ingredients which specifically address Immune system issues. AN AUTOSHIP VERSION OF THIS PRODUCT IS ALSO AVAILABLE FROM OUR PRODUCT LIST. HardyPet Immune is specifically formulated version of our original HardyPet Complete which contains the same amazing 42 ingredients as the Complete, and slightly more of the ingredients which specifically address Immune system issues. AUTOSHIP PROGRAM PROVIDES REDUCED COST AND FREE SHIPPING. See Rules Below.